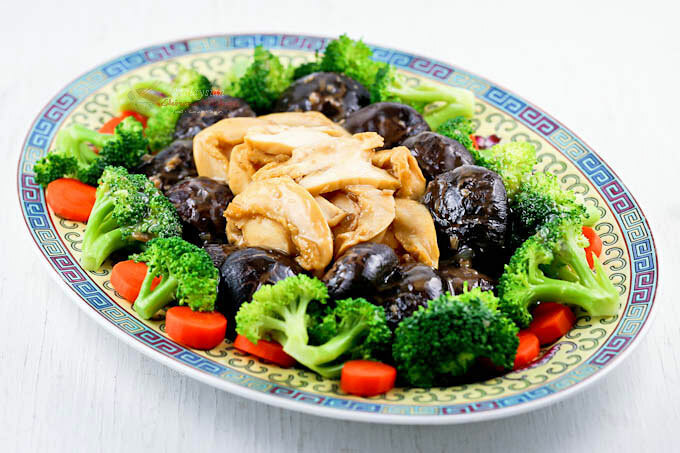 Braised Mushrooms and Abalone is a dish I remember from childhood. Back in those days, this dish was popularly served at wedding banquets. While most kids did not really care for it, I am sure the adults did. Often they would get a double portion. The entire platter would be transferred to them from the table where most of the kids sat at. Today, this dish is seldom served because abalone has gotten really pricey. Still it is worth a splurge if you have never tried it. Canned abalone are the most easily available. They usually appear at the stores close to the Chinese New Year. Most of them are quite small, about two inches in length and only require a couple of minutes to cook, at most. Any longer than that and they will end up being tough and rubbery. For this recipe, I have decided to keep it simple so as not to mask the taste of the abalone. I also wanted the sauce to be relatively light in color. Hence, only soy sauce and Shao Hsing rice wine are used as flavorings. Both Paul and I are very pleased with the results. It was the first dish to disappear from our Reunion Dinner on Sunday evening. 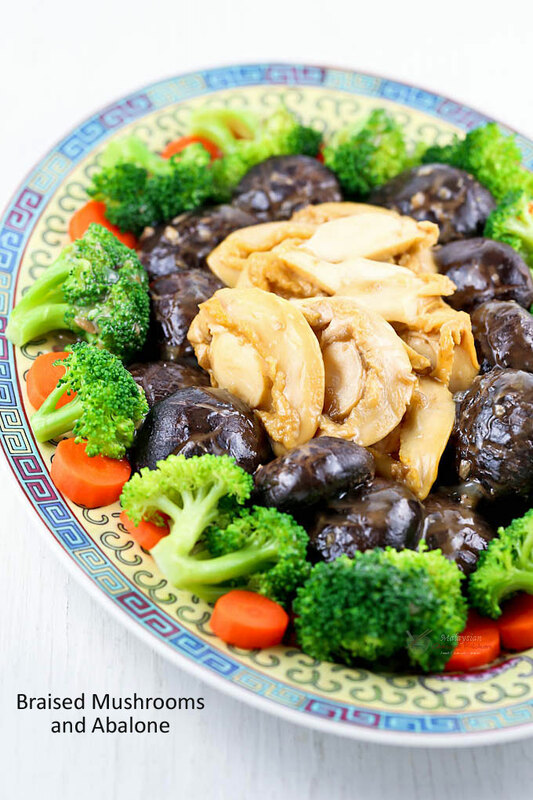 Prepare this special Braised Mushrooms and Abalone for the Chinese New Year or a special occasion. It is a treat you don't want to miss! Wash and soak mushrooms for 4 hours or overnight until soft and puffy. Remove and trim off stalks. Strain and reserve ¾ cup (180ml) soaking liquid. In a clay pot or heavy bottom pot, heat vegetable oil. Add pork belly. Fry for 2 minutes. Add garlic and continue to stir fry for 30 seconds. Then add mushrooms. Stir to coat mushrooms with oil. Add soy sauce and Shao Hsing rice wine. Pour in mushroom soaking liquid. Bring to a boil. Reduce heat and simmer on low for 45 minutes. Bring a medium sized pot of water to boil. Add a little salt. Blanch carrots for 30 seconds to 1 minute. Remove with metal strainer and dunk into cold water to stop the cooking. Drain. Do the same for the broccoli florets. When mushrooms are cooked, do a taste test. If it is not salty enough, add just a little salt. Add abalone. Cook for no more than 2 minutes or it will be tough and rubbery. Ladle mushrooms and abalone out of the pot, leaving the sauce in the pot. Pour in corn starch mixture to thicken the sauce. If it appears to be a little too thick, add a little water. Sauce should be of a pourable consistency. Turn off stove. Arrange blanched vegetables decoratively on a platter to form an outer circle. Arrange mushrooms to form an inner circle. Then place abalone in the center. Abalone may be served whole or sliced lengthwise. 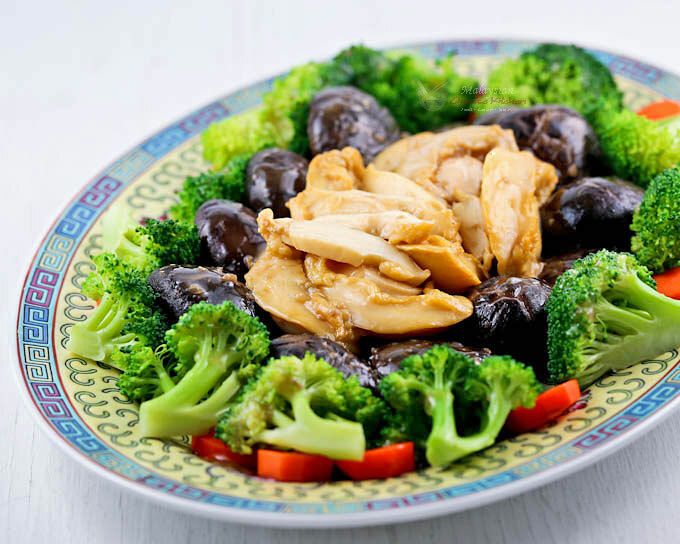 Drizzle sauce over abalone, mushrooms, and vegetables. Serve immediately. Abalone should be cook no more than 2 minutes or it will be tough and rubbery. WISHING YOU ALL A VERY HAPPY, HEALTHY AND PROSPEROUS CHINESE NEW YEAR!